Celebrating 10 Years! Read the anniversary entry. Since 2005, talking about the built environment in layman’s terms for people who don’t have architecture degrees but still love buildings. Special emphasis on mid-century modern design and architecture. 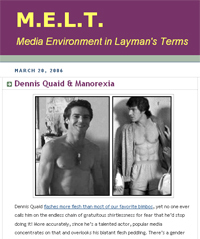 Talking about the media environment in layman’s terms since 2005. Everyone knows how a song casts you back to a specific moment. When memory fails, remember a song to recall an exact point in time. If there is no song, I can’t remember it; I have a jukebox soul. Chronologically stringing these memories together is a song line. A St. Louis musical duo remodeling 6 songs by other artists. Hear (and see) the results.